You can watch a replay of a livestream of me unboxing and assembling this month's kit according to the package instructions, on my Facebook Business Page by either clicking the image below, or clicking HERE. So, I calculated that you should have enough leftover pieces to make 6 of the cards below, if you assemble the cards in the kit using the pieces in the colors shown in the sample picture above. I added Crumb Cake Cardstock and Grapefruit Grove Cardstock. There should be 6 of the Coastal Cabana feathers left, 6 of the Night of Navy sprigs, 6 self-adhesive sequins, and 8" of the ribbon left (which you can cut to 6 pieces about 1-1/4" each). I usually try to stay as close to the kit contents as I can, and I did fairly well with the card, but I needed to add the 3/4" Circle Punch, the Leaf Punch and the Cookie Cutter Builder Punch, as well as some Cajun Craze Cardstock to create the Turkey Treat. Keep scrolling to see pictures of how I used the punches. 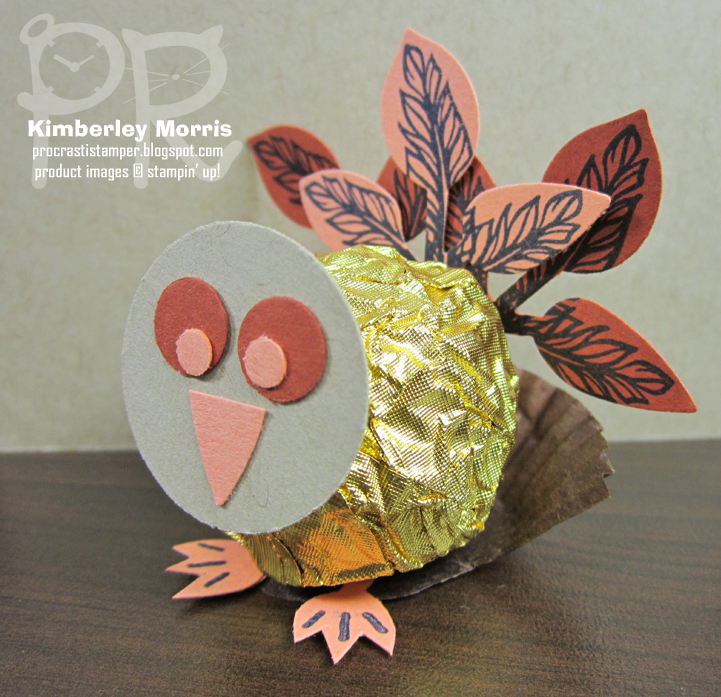 I used the Leaf Punch for the feet, the beak, and the tail feathers. I used the Cookie Cutter Builder Punch to create the eyes. In the picture above, you can see how I trimmed the little liner in which the Ferraro Rocher candy sits. I just snipped down to the bottom, and followed the crease of the circle to cut off the front half of the liner. 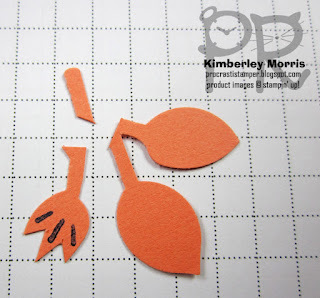 Then I stamped the feet onto a couple of pieces punched from the Leaf Punch, and adhered them between the foil ball and the liner with Mini Glue Dots. 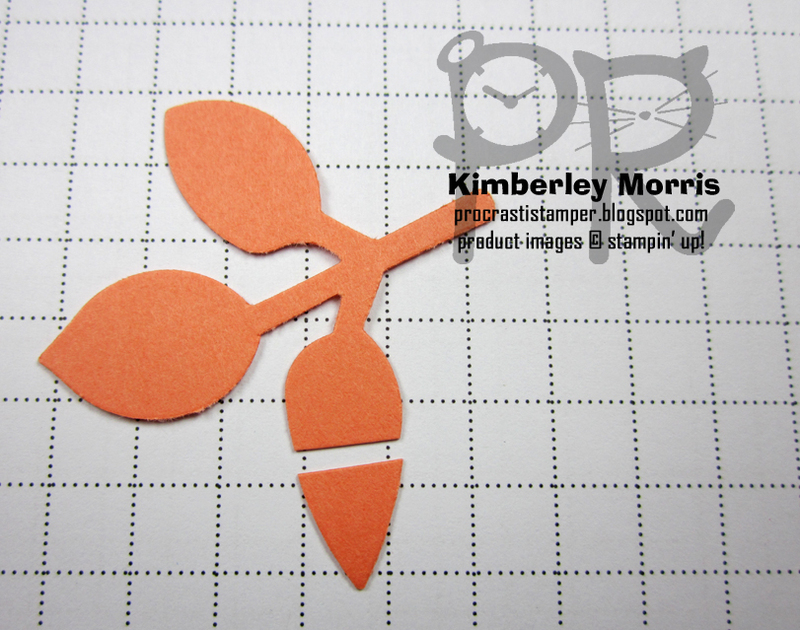 You can see how I trimmed the Leaf Punch in the pictures below. 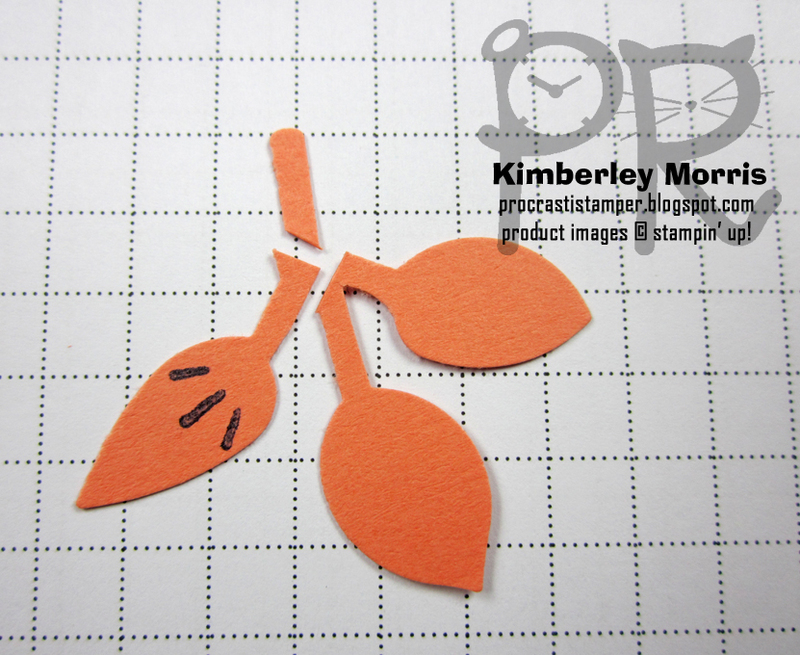 First I punched out two pieces of Grapefruit Grove Cardstock with the Leaf Punch. I turned one of them over so I'd have mirrored pieces. 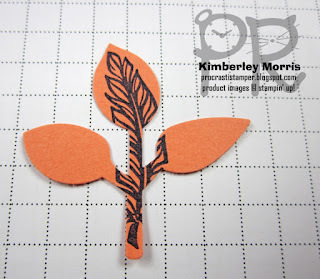 Then I stamped the little 3-ray image from the Paper Pumpkin stamp set on the skinny leaf from each sprig. 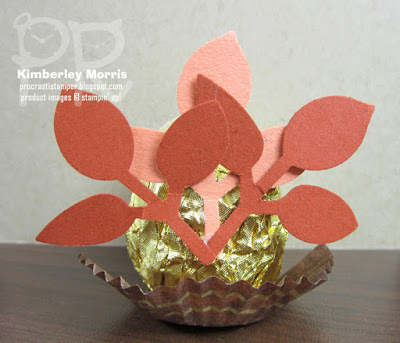 Then I trimmed off the one leaf I stamped on each sprig, keeping a good bit of the stem so I would have a nice length to tuck under the foil ball, to keep the adhesive out of sight. After I separated the leaf and stem, I used my Paper Snips and snipped down around the 3-ray image I stamped, as you can see in the picture below. I punched out another piece of Grapefruit Grove Cardstock with the Leaf Punch for the beak. I then trimmed off the end of the skinniest leaf to use for the beak. I found it SUPER helpful to use the Take Your Pick Tool to place the punched eyes and beak onto some tiny dots of Tombow Liquid Glue that I placed on the Crumb Cake Cardstock I'd punched out with the 3/4" Circle Punch for the head. 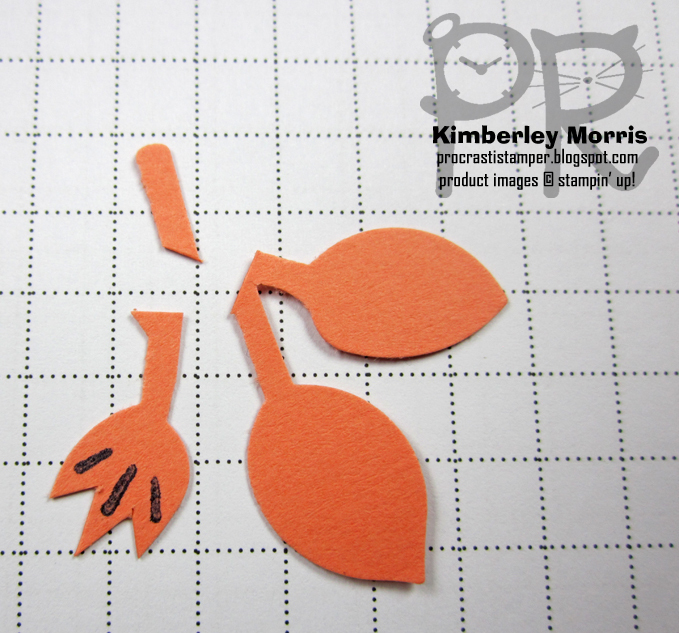 Below you can see the back of the 3 sprigs I punched with the Leaf Punch, to use for the tail feathers. 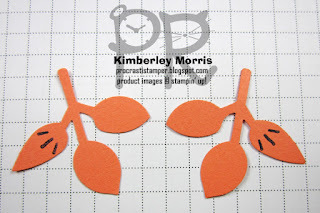 Two sprigs are from Cajun Craze Cardstock, and one sprig is from Grapefruit Grove Cardstock. I just layered them and adhered to each other, and to the foil ball, with Mini Glue Dots. 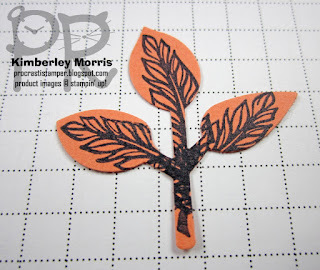 To get the feathery look on the Leaf Punch sprigs, I stamped the leaf image from the Paper Pumpkin kit, using a Night of Navy ink pad (a mini one was included in the kit). 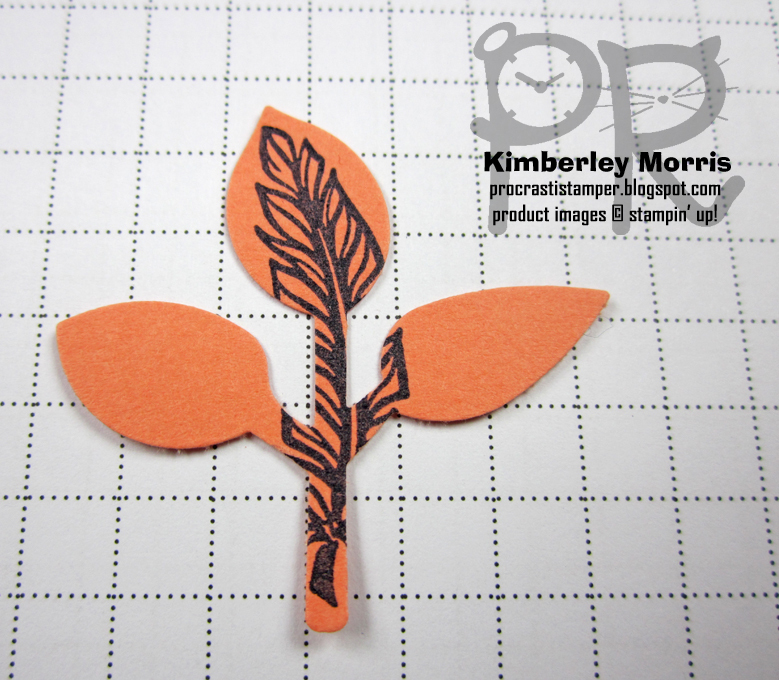 I first stamped the feather straight up the stem, placing it as far up to the tip of the leaf as I could get it. 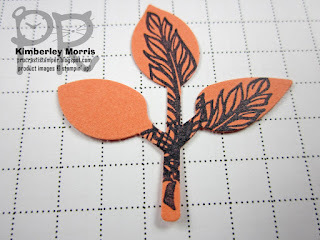 Then I stamped the feather image onto the right leaf, as far to the tip of the leaf as I could get it, without the bottom part of the feather getting ink onto to the left leaf. And finally, I stamped the feather image onto the left leaf, again trying to stamp the feather as close to the tip of the leaf as possible. Then I layered all 3 stamped sprigs and adhered them to the back of the candy. 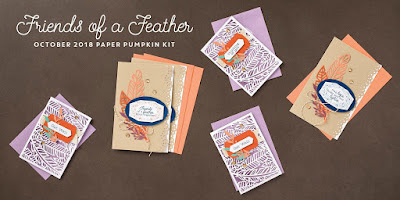 You could technically stamp all the feathers onto separate pieces of cardstock and hand trim them, but that would make for a bunch of separate feathers to glue together, and I'm way into making things easy! These will make great table favors for Thanksgiving...you've got plenty of time to get your candies (I got a big container of them at Costco), order your punches and cardstock, and get plucky with it! Seriously, though, that Take Your Pick Tool will make the job go so much faster, so don't forget to grab one with the rest of your supplies. 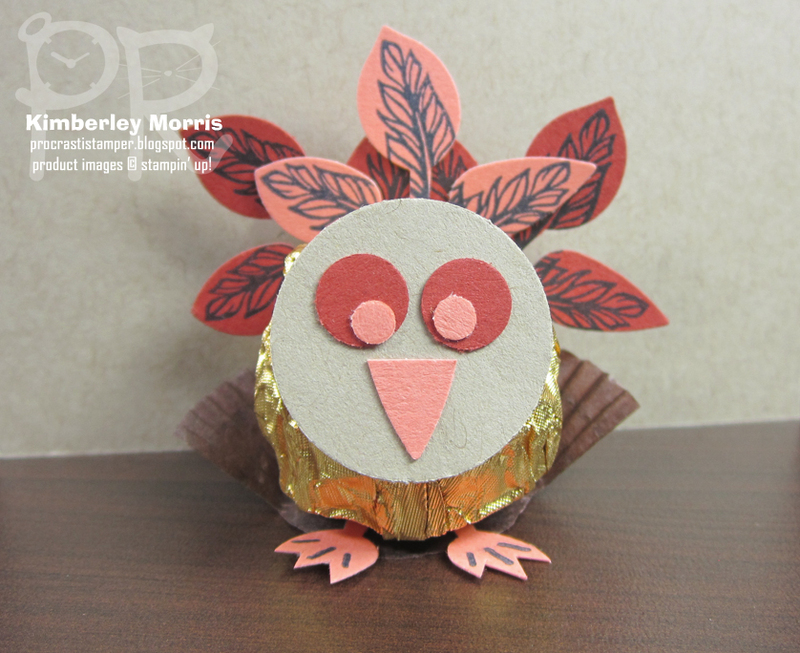 NEXT UP: Click the Next button below to see Melissa's feathery projects! If you have any problems navigating the hop, there is also a Blog Roll listed below for your convenience. You're not going to want to miss this! Make sure you SIGN UP HERE no later than 11:59pm MT on November 10th to receive this kit in November. It will include supplies to make 10 holiday cards (5 each of two different designs), envelopes included. 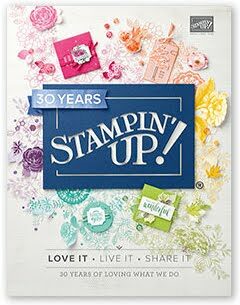 The specially designed box is a great Sneak Peek at what's inside! 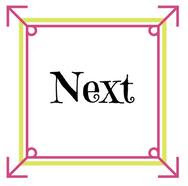 The coordinating colors will include what you see on the plaid box - Cherry Cobbler, Garden Green, Soft Suede, Gold, Very Vanilla, and Whisper White.